Today I found out why iodine is added to salt. Iodine first began being added to salt commercially in the United States in 1924 by the Morton Salt Company at the request of the government. This was done as a response to the fact that there were certain regions in the U.S., such as around the Great Lakes and in the Pacific Northwest, where people weren’t getting enough iodine in their diets due to it not being prevalent in the soil in those regions. Among other problems, this caused many people to develop goiters (swelling of the thyroid gland, also sometimes spelled “goitre”). About 90% of people who develop a goiter do so because of a lack of iodine in their diets, so the simple solution was to add iodine to something pretty much everyone consumes fairly regularly, namely salt. This practiced was not thought up by the U.S., but was copied from the Swiss who were adding iodine to salt at this time for the same reason. This resulted in researchers at the University of Michigan testing this practice out with good results and subsequently Morton Salt Company adopting the practice on a national level. This ultimately didn’t cost Morton and the other salt companies that followed suit much money, only a few cents per person per year in iodine, but drastically cut the number of people who developed goiters in the United States and beyond as the practice gradually became adopted throughout much of the developed world. Today because most food in developed countries like the United States often isn’t grown locally, coming from all over the country and world, depending on the food item, continuing to add iodine to salt isn’t strictly necessary. People in regions where the soil is lacking in iodine will likely consume plenty of food from regions where it is not, thus getting the iodine their bodies need, particularly because our thyroids don’t need much to function properly. For reference, the U.S. Food and Drug Administration recommends that you consume about 150 micrograms of iodine per day and, on average, men in the United States gets about double that amount per day and women each consume about 210 micrograms of iodine per day. Your thyroid itself only needs about 70 micrograms per day to function properly. Even though most people get plenty of Iodine in their diets, because Iodine is so critical to our bodies functioning properly and the Tolerable Upper Intake Level is so high (about 1100 micrograms per day, and you won’t take a fatal dose unless you ingest about 2 million micrograms, or 2 grams), adding it to salt is still recommended by many government health agencies the world over to stave off certain health problems. Specifically, Iodine is a critical element used by your thyroid in being able to synthesize certain gland secretions which, among other things, influences your heart, metabolism, nerve responses, etc. Further, a lack of iodine during pregnancy and in the baby’s diet after being born can cause a myriad of significant health and developmental problems. Iodine deficiency has also been linked to increased difficulty with information processing, diminished fine motor skills, extreme fatigue, depression, weight gain, and low basal body temperatures, among other things. Iodine deficiency, besides being a leading cause of goiters in the world, is also currently the number one easily preventable cause of mental retardation in the world, due to the fact that, despite iodized salt being fairly prevalent, there are still about two billion people in the world today that are iodine deficient. Iodine was discovered by accident by the son of a saltpeter manufacturer, Bernard Courtois, in 1811. This was thanks partially to the Napoleonic Wars which resulted in saltpeter, for gunpowder, being in high demand (the Napoleonic Wars also helped give us canned food and cheap and easily made pencils, read more at the links). In the process of producing saltpeter, sodium carbonate was needed. In order to get the sodium carbonate, the saltpeter manufacturers would isolate it from seaweed by burning the seaweed and washing the ash with water. The waste from this process was then destroyed with sulfuric acid. 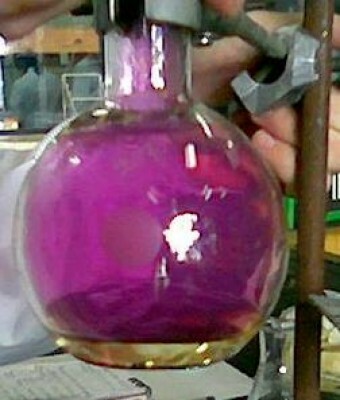 At one point, Courtois accidentally added too much sulfuric acid to the waste and he observed a purple vapor, which crystallized on cold surfaces. He then gave samples of this substance to others to study in more detail as he suspected he’d discovered a new element. One person he gave the substance to was chemist Joseph Louis Gay-Lussac, who subsequently announced at the Imperial Institute of France that Coutois’ discovery was either a new element or was some compound of oxygen. Another scientist, Humphry Davy, also studied the substance and determined that it was indeed a new element. During the Cold War, it was a common practice for people to have iodine pills on hand in case of a nuclear strike. Among many other problems we’d all have during a nuclear war is the issue of radioactive iodine accumulating in our thyroids. In order to combat this accumulation, the idea was to take an iodine pill and give your thyroid so much iodine that it wouldn’t be able to absorb the radioactive iodine. The first confirmed people to figure out how to cure most goiters were the Chinese during the Tang Dynasty (618-907). During that time, they treated people with goiters by grinding up the thyroids of sheep and pigs to form a powder which was then consumed in a pill or in powdered form. These animal thyroids are very iodine rich, so this cure worked quite well, though they didn’t realize why at the time. The Pharmacopoeia of the Heavenly Husbandman also implies that as early as the 1st century BC the Chinese cured goiters with sargassum (a type of seaweed), which also contains significant quantities of iodine. Whether this dating is accurate or not, at least as far as recorded history goes, it appears that the Chinese were the first to come up with an effective cure for a goiter. Seafood typically contains relatively large amounts of iodine, so if you eat much seafood, you’re very likely getting more than enough iodine, without consuming salt laced with it. According to a study done at the University of Texas about 47% off major salt manufacturers no longer put enough iodine in their salt to meet the U.S. Food and Drug Administration’s recommended levels. This problem is further exacerbated when salt is exposed to air or in humid regions. This will gradually lower the iodine content in the salt over time. Salt is typically iodized by spraying it with potassium iodate at a rate of 60 ml per one ton of salt (which comes to a little over $1 of potassium iodate per ton of salt). Salt with iodine added makes for a poor choice for curing, as the iodine in large enough quantities will add a certain amount of bitterness to the cured food. While pure salt doesn’t technically expire, when iodine is added, it does, having a shelf life of about five years on average, according to Morton Salt Company. Calcium silicate is typically added to table salt as an anti-caking agent, to keep the salt flowing smoothly, rather than clumped together as it absorbs moisture. Around .5% of the contents of a typical table salt container is calcium silicate. Iodine was originally named “iode” by Gay-Lussac from the Greek word for violet (iodes), due to the purple vapor observed which formed the crystals. How do they obtain Iodine today? In the same way as when it was discovered? 1. Over a billion people are at risk of iodine deficiency today in the developing world, especially in formerly glaciated or mountainous areas, leading to cretinism (stunted mental and physical growth) with hypothyroidism. Although iodized salt has prevented this problem in the developed world, it is still not provided in many areas where it would be cost-effective. 2. After the US resumed conscription in World War I, many recruits were deemed ineligible because of goiter and associated problems. This is what led to the Progressive mandate for iodized salt. 3. Some tests on fish with goiter were conducted but no large randomized controlled studies done before iodine was added. It seems that there was an excess of deaths in the next some years because the added iodine promoted hyperthyroidism in some, leading to thyrotoxicosis and heart attacks. Today thyroid problems are more easily diagnosed to avoid such complications, and randomized controlled studies required first. 4. Recommendations to attempt to lower blood pressure by reducing sodium intake have probably led to lower iodine intake in some, maybe resulting in excess subclinical hypothyroidism. Morton salt adds manmade Iodide, as opposed to Iodine. I don’t know if all of the salt companies do it this way. I am torn on whether I should discontinue buying salt with Iodide now. “Iodine is an essential mineral. Adult men and women should have approximately 150 micrograms of iodine each day, and most people in the United States easily obtain this much through their diet, says the National Institutes of Health. Elemental iodine cannot be found in nature. It’s too reactive and will readily form iodate salts when left on its own. OMG I searched and searched before I commented, and couldn’t find anything on how the body turns iodide into iodine, matter fact found stuff implying the opposite, plus I was a chemist which gave me more confidence, but not a biochemist. So I owe a bit of apology here. my main points are still good, like straight iodine is a better bet than potassium iodide and that but I guess I’m just sore that I am sensitive to it and because I was wrecked by the system. Well as coincidence has it, I came across this after one last look. Holy heck, here’s some actual “bonus facts” for ya. They use potassium iodide to iodize salt. Know how much of an iodine source that is? ZERO! Nothing at all. Here’s proof. If iodide is a source of iodine then chloride is a source of chlorine. Guess what would happen to us if we consumed a teaspoon of chlorine a day? We might not make it to the second day. There you have it. How is everyone so duped? Cmon. They’re not doing it for our benefit but to increase economy. It’s always been like that. At least ever since the AMA took over and laughed the real doctors off the stage. Allopaths are only good for surgery and prescriptions. I wish I would have known before they ruined me for life and tens of thousands of others like me. It’s like this. Straight iodine works better than pot iodide anyway because 1 out of 3 react in a bad way to pot iodide, even in small amounts, and don’t even know why they are feeling weird. It used to be a universal medicine a long time ago but what they don’t tell you is the percentage of bad reactions that resulted and the percentage of those that are so sensitive to it that it killed them. My life was ruined by Cipro. Some people can take it, 1 in ten have a bad reaction, many recover and many never recover and to date there are over 5,000 deaths linked to Cipro and Levaquin. And I found out I am also sensitive to pot iodide. Anyone with hypothyroid needs to avoid all iodine and iodide. Hyperthyroid can benefit from iodine though. There is something called microdosing though, which in my opinion would benefit even those with hypothyroid and it’s the way you should go about trying any new medication. In this case you would take “nascent” iodine (without any iodide at all! read the bottle), put one little drop into a quart of good water. Let stand for a while, maybe shake it a little. Then take 2 or 3 slugs through the day and put the rest away. Or you can try putting one drop in a pint of water and then taking a small amount out like a quarter teaspoon and add it to another pint of water, spill the first out and take a few slugs from the second. If you find it helps in any way then you can begin by either increasing the concentration or decreasing it to see which way the best dilution lies. Or just see a good homeopath; it’s real folks. I cured my IBS which no doctor could accomplish because they refuse to listen to reason, also because the gov’t made it impossible for them to legally prescribe borax, but they could tell you about it and have you sign off on it if they had a heart.